Is that Whiting Street in St Clair? Michael wrote: Is that Whiting Street in St Clair? Yes, it most certainly is. Coal train SB in the fall of 2018. Yes, that's Whiting Street and the ex PH&D RR now CSX, in St. Clair, St. Clair County. Looking east toward downtown St. Clair and the St. Clair River. Between Cedar Street and Fred W Moore Highway in St. Clair. 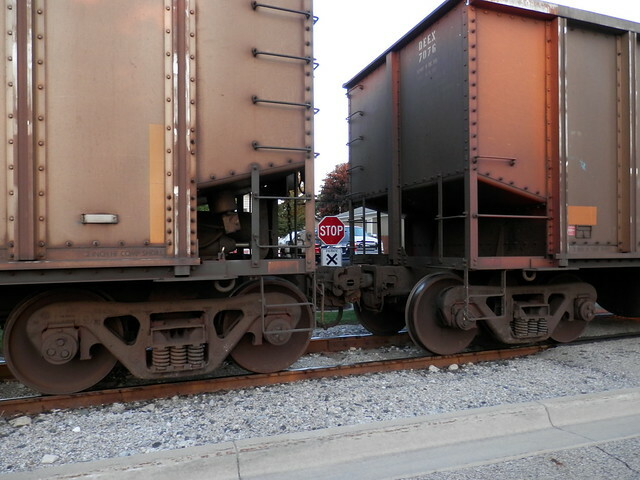 The former Port Huron & Detroit RR never have any regular passenger train at all. Last edited by railrod1949 on Thu Jan 24, 2019 8:07 pm, edited 2 times in total. Yes, that's Whiting Street and the ex PH&D RR now CSX, in St. Clair, St. Clair County. Looking east toward downtown St. Clair and the St. Clair River. Between Cedar Street and Fred W Moore Highway in St. Clair. Passenger train service on the ex PH&D RR between Port Huron and Marine City was discontinued many, many years ago. There was regular passenger service on the PH&D? That's news to me as I'm pretty sure there was no passenger service on the line. Somewhere along the CN Mt. Clemens Sub near Fraser or Mt. Clemens. Yes, It's the back side of A_ _ End of Arm Tooling, Inc. on the north side of Goldsmith, just east off Sheldon Road, south of the CSXT RR main line, in Plymouth. Final runs of the remaining passenger trains on the ex C&O railway trains nos. 11, 12, 14, and 15 the Pere marquette, between Detroit FSUD and Grand Rapids and train nos. 46/47 the George Washington between Detroit FSUD and Toledo (to and from Washington, DC), were made on april 30, 1971. Yes, It's the back side of A_ _ End of Arm Tooling, Inc. on the north side of Goldsmith, just east off Sheldon Road, south of the CSXT RR main line, in Plymouth. Wayne County. Final runs of the remaining passenger trains on the ex C&O railway trains nos. 11, 12, 14, and 15 the Pere marquette, between Detroit FSUD and Grand Rapids and train nos. 46/47 the George Washington between Detroit FSUD and Toledo (to and from Washington, DC), were made on april 30, 1971. 8:00 AM this morning. The internet can guide you to the location. It still says Santa Fe on the nose. PatAzo wrote: The internet can guide you to the location. The last passenger train was.....well shortly before noon. North La Crosse.WI on the former Burlington Route RR, now BNSF. I had a pretty good idea with the silos in the picture but having the BWP trailer helped put it all together. That was a really good location you found.